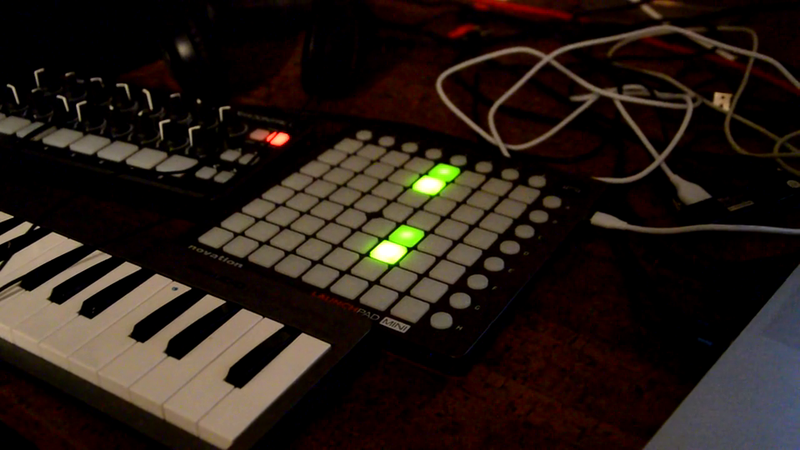 ... or how i made my launchpad pro talk to my 0-coast via a trs-midi cable. 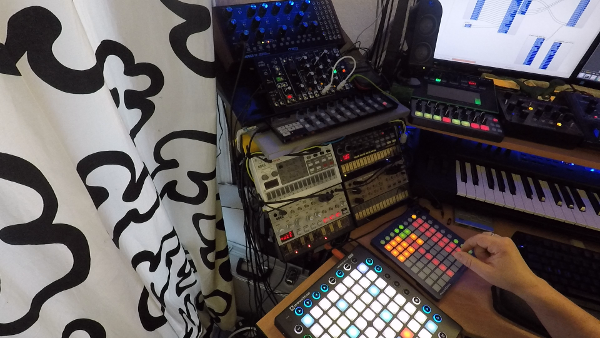 I recorded a new jam session using my volcas, my kaospad mini, bitwig-studio and my launchpad. 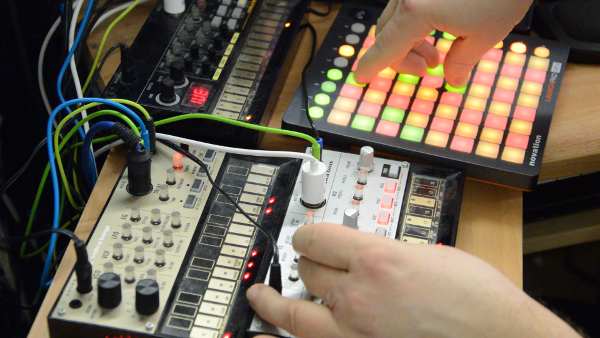 The arpegios are created using the volca bass and the kaospad mini. 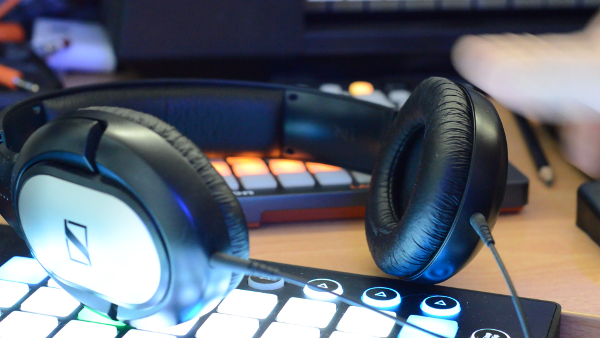 I used the bitwig arpeggio note effect and enter the notes using the launchpad. I created a small chuck script that makes ardour jump to a marker using osc messages. These messages get triggered by the midi signals created by my launchpad mini. I also synced my volca bass to the track using midi-clock. Unfortunately ardour doesn´t send midi sync signals when playing in loop mode. So I created a midi track and sent the same note that my chuck script uses to trigger the "jump-to-marker-1" signal to create the loop. The lower 5 glowing buttons control the mute state of the first 5 tracks. you can download my chuck code after this video. 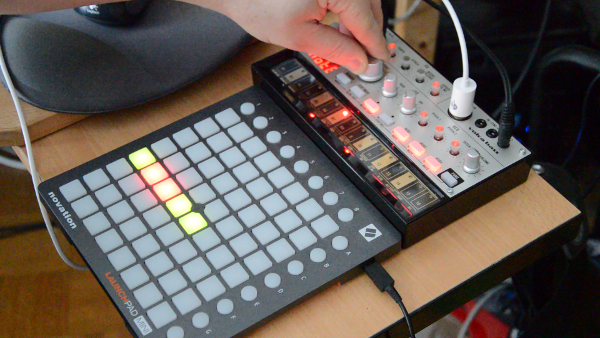 All the sounds except the drum loop have been created using a volca bass or a volca keys. The bass sequence is the same I used in my last blogpost only played slower. 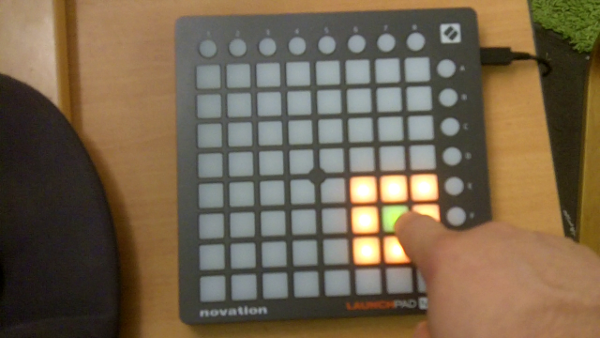 Most launchpad videos feature cool effects running on a launchpad. 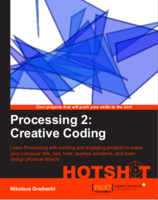 There are several tutorials on how to make such effects using ableton live. But since my launchpad is connected to a linux box this doesn´t help me much. So I wrote a short chuck script that reacts to the midi events sent by the launchpad and creates an arpeggiator effect to light up the leds. The color can be influenced by changing the velocity. 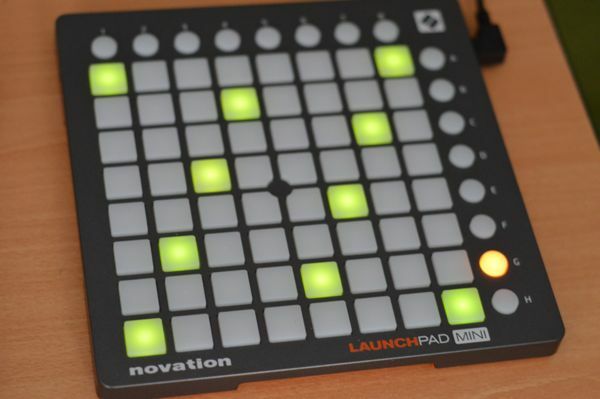 This script works with a launchpad S or a launchpad mini. 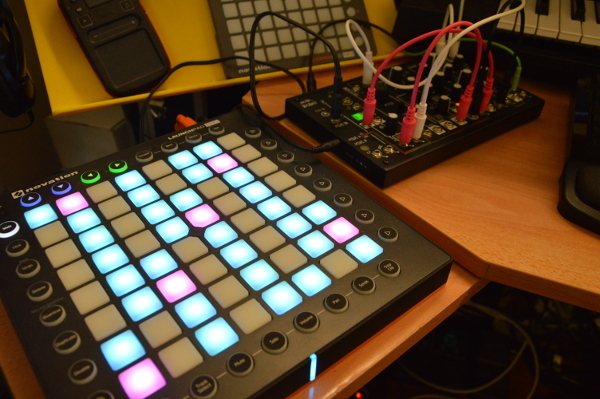 I wrote a pure-data patch that allows me to use my launchpad mini to play my synthesizers. 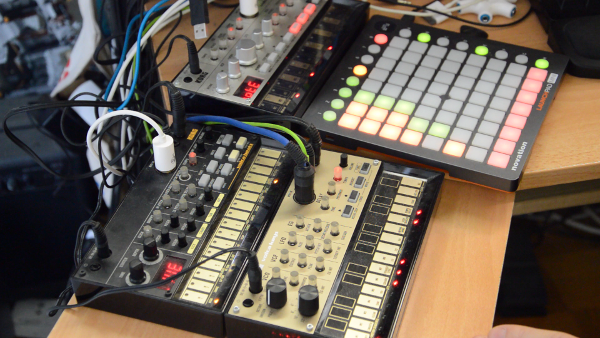 The scales use a similar layout to ableton push (hence the name pushy). To translate between the default midi mapping and the push layout I first used a div and a mod operation to find out what row and column a pressed button was in. Then I calculate the offset for each row to implement the quater shift everytime you go up one row. Then I use a puredata table that holds the scale to be played (currently major and minor) to create the midi-number. The base tone can be shifted up and down by 12 semitones using the E and F button or by 1 semitone using the C and D buttons. To connect it to my midi equipment I use jack on my linux box and wire it to my synths using qjackctl.